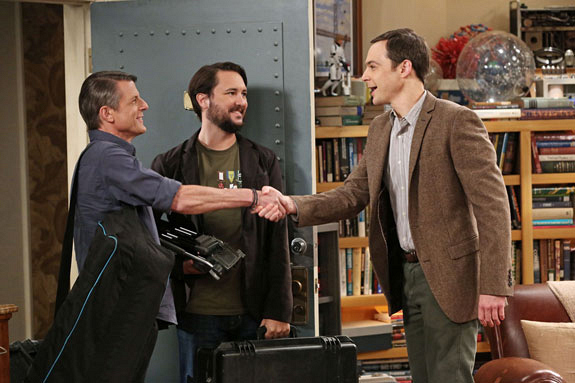 Sheldon set to be interviewed for a Spock documentary by Leonard Nimoy's son. Fans of The Big Bang Theory and Star Trek can rejoice because an upcoming episode the geektastic TV sitcom will feature a guest appearance from the son of Mr. Spock himself, Adam Nimoy! Plus, we have an exclusive first look at the episode, which airs on Thurs., Nov. 5 at 8/7! In "The Spock Resonance," recurring guest star Wil Wheaton will appear alongside Adam, an accomplished writer and director in real life, who asks Sheldon Cooper to be in a documentary about his beloved father, Leonard. While being interviewed, Sheldon struggles to suppress his emotions about his recent break-up with Amy, despite his overwhelming excitement for the sci-fi subject matter. Though Leonard Nimoy has never physically appeared on The Big Bang Theory—in fact, the actor passed away in Feb. 2015—his presence has been felt in many episodes throughout the series' run. For example, in "The Codpiece Topology" (Season 2, Episode 2), Sheldon attends a Renaissance faire dressed as Spock, complete with Vulcan ears. Then, in "The Transporter Malfunction" (Season 5, Episode 20), Sheldon had a dream about a Spock action figure that comes to life. If we were to go through the entire series and try and pick out all the Starfleet references, we'd be here for quite a while. So, to save time—and a multitude of Vulcan salutes—be sure to mark your calendars for this symbiotic episode of The Big Bang Theory, which will air on Nov. 5 at the show's new day and time, Thursdays at 8/7c.